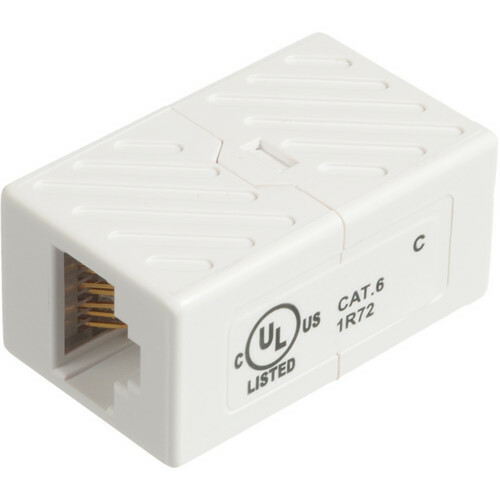 The Cat 6 Jack-to-Jack Inline Coupler White from Comprehensive helps to connect two Cat 6 cables together. It has a female-to-female connection design. The coupler is used in data applications. Box Dimensions (LxWxH) 2.2 x 2.2 x 1.0"
Cat 6 Jack-to-Jack Inline Coupler White is rated 4.0 out of 5 by 2. Rated 3 out of 5 by Brent from OK, but not great Running video through cat-6 and found these couplers' tolerance where the rj-45 jack seats is not snug enough so there is some wiggle and instability of contact and signal consistency. It might be fine for some applications, but for this project I will change them out. Rated 5 out of 5 by Mr.Wurtz from Quality Product Not much to say here. This coupler works perfectly and is built with quality in mind.